Ted Cruz was the surprise winner in the Iowa Republican caucuses tonight edging out Donald Trump who in turn edged out Marco Rubio in a very strong voter turnout. On the Democratic side, Hillary Clinton is just a handful of votes ahead of socialist Bernie Sanders in a vote still too close to call. Given that Clinton was ahead of Sanders by 40 percentage points a few weeks ago, this result may raise more eyebrows than Cruz did by winning the Republican side. Via Real Clear Politics, the delegate totals look like this. Mike Huckabee dropped out tonight. In speeches following the caucuses, both Trump and Rubio reached out to Huckabee. 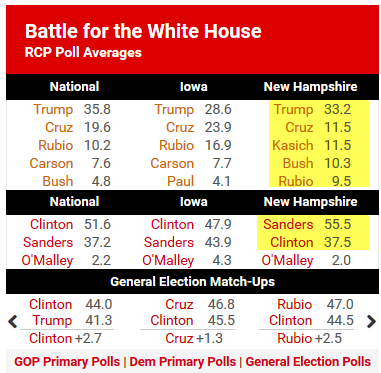 Trump and Sanders are both supposed to easily win new Hampshire. 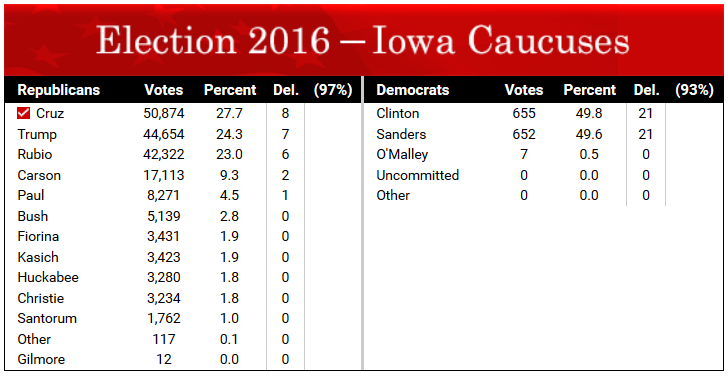 Unless Trump puts in a poor New Hampshire showing, Iowa will soon be a meaningless result. Hillary's test comes after New Hampshire.